2 აპრილს "დავასუფთაოთ საქართველო" კამპანიის ფარგლებში ბოლნისის რაიონის სოფლებში თამარისი და დისველი ჩატარდა გამწვანების აქცია, რომელშიც ორგანიზატორებთან ერთად მონაწილეობდნენ ადგილობრივი მმართველობისა და თვითმმართველობის წარმომადგენლები, რწმუნებულები, ადგილობრივი მოსახლეობა და ახალგაზრდები. 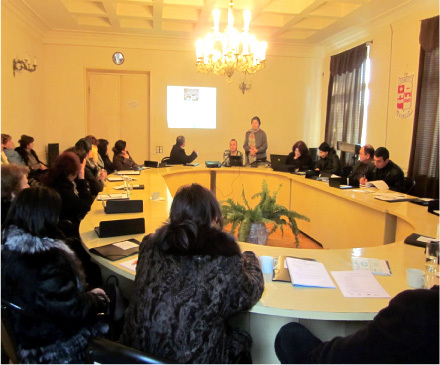 Stakeholder meetings were carried out in Gori, Kareli and Sagarejo regions under the project "Clean Up Georgia – Raising of Public Awareness and Involvement in Solid Waste Management Improvement" on 28-29 March, 2011. 27 მარტს "დავასუფთაოთ საქართველო" კამპანიის ფარგლებში ჩატარდა თბილისის ზღვის მიმდებარე ტერიტორიის დასუფთავების აქცია, რომელშიც აქციის ორგანიზატორებთან ერთად მონაწილეობდნენ თსუ-ს სტუდენტური თვითმმართველობის სტუდენტები, მოხალისეები და ადგილობრივი მცხოვრებლები. 26 მარტს "დავასუფთაოთ საქართველო" კამპანიის ფარგლებში ბოლნისის რაიონის სოფლებში თამარისი და ცურტავი ჩატარდა დასუფთავების აქცია, რომელშიც აქციის ორგანიზატორებთან ერთად მონაწილეობდნენ ადგილობრივი მმართველობისა და თვითმმართველობის წარმომადგენლები, გამგებლები, გამგეობის თანამშრომლები, სოფლის რწმუნებულები, ადგილობრივი მოსახლეობა და სკოლის მოსწავლეები. 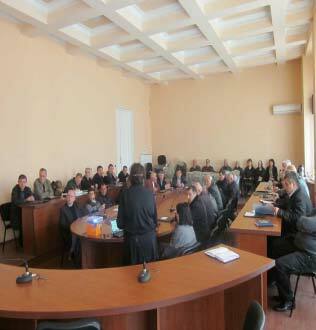 Stakeholder meetings were carried out in Kvemo Kartli region (Rustavi, Marneuli and Gardabai) under the project "Clean Up Georgia – Raising of Public Awareness and Involvement in Solid Waste Management Improvement" on 24, 36 and 27 January, 2011. Stakeholder meetings were carried out in Racha-Lechkumi-Kvemo Svaneti region (Oni and Ambrolauri) under the project "Clean Up Georgia – Raising of Public Awareness and Involvement in Solid Waste Management Improvement" on 17-18 Januari, 2011. 2010-11-25 Clean up and biorestoration activities were carried out in Rustavi under the "Clean Up Georgia" campaign on 25 - 26 November, 2010. 25 - 26 November, 2010. 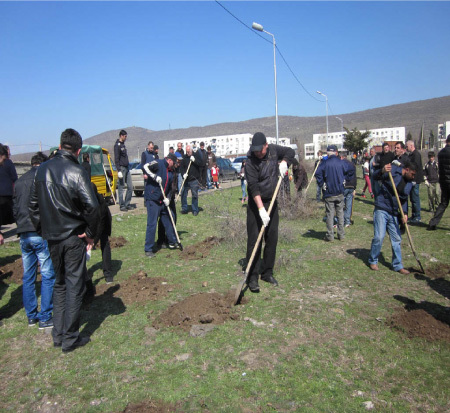 Clean up and biorestoration activities were carried out in Rustavi under the "Clean Up Georgia" campaign on 25 - 26 November, 2010. Territories of 26 public schools and 21 kindergartens were cleaned up on November 25 in Rustavi city. 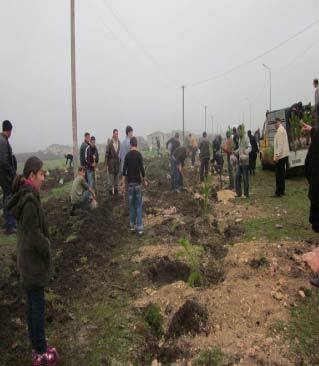 About 2000 seedlings were planted on the mentioned territories on November 26. 2010-10-20 Week of International day of Climate Action opened on 17 October 2010 Tbilisi. Week of International day of Climate Action opened on 17 October 2010 Tbilisi. The week (17 to 24 October) is organized by Greens Movement of Georgia/FOE and supported by European Union. 2010-10-20 Clean Up action was held on October 23, 2010 in Isani administrative district. 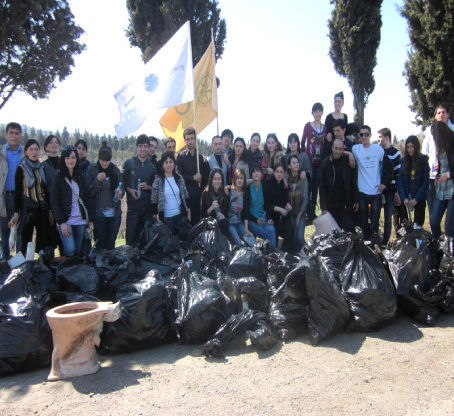 Clean Up action was held on October 23, 2010 in Isani administrative district. The event was organized by Greens Movement of Georgia/FOE Georgia and Union for Sustainable Development EcoVision under the Clean Up Georgia Project. 2010-09-18 Wide Clean Up campaign – "Clean Up the World, Clean Up Georgia!" Wide Clean Up campaign – "Clean Up the World, Clean Up Georgia!" took place in Georgia on 17, 18, 19 September 2010. 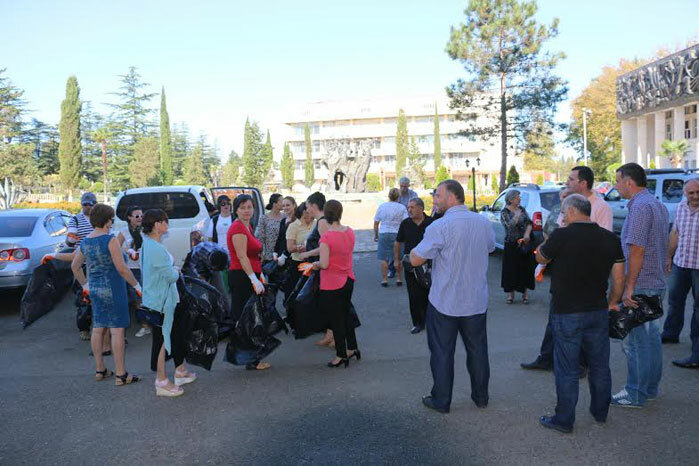 Special information flyers on forthcoming Clean Up Campaign were distributed in all Administrative Districts of Georgia. Large advertising banners were installed on all central highways of the country.